This recipe for Almond Honey Nougat resembles the popular European sweet Torrone. It is a chewy, sweet confection studded with three kinds of crunchy nuts and delicately scented with extracts and orange blossom water. This recipe requires careful timing, so be sure to have read the instructions carefully and have all of your ingredients prepared before beginning. It is best to make nougat on a clear day with low humidity--excess moisture in the air can interfere with the texture of the final product. Be sure to check out the photo tutorial with step-by-step instructions showing how to make nougat. Prepare a 9x13 pan by lining the bottom with edible rice paper. Place sugar, corn syrup, honey and water in a large heavy saucepan over medium heat. Stir constantly until the sugar dissolves, then use a wet pastry brush to wipe down the sides of the saucepan to prevent sugar crystals from forming. Insert a candy thermometer and continue to cook the syrup, without stirring, until the candy thermometer reads 252. When the sugar syrup is nearing the proper temperature, begin to beat the egg whites until stiff peaks form. Try to time the beating so that the stiff peaks stage coincides with the proper temperature of the syrup. If the egg whites are ready before the syrup, stop the mixer so that they are not overbeaten and crumbly. Once the sugar syrup is at 252, carefully remove 1/4 cup of syrup and keep the rest of the syrup on the heat. With the mixer running, slowly pour the hot 1/4 cup of syrup in a thin, steady stream into the egg whites. Beat the whites at high speed for five minutes until they hold firm peaks. While the egg whites are being beaten, continue to cook the sugar syrup until the thermometer reads 315. Monitor the syrup carefully, as it can quickly overheat and burn near the end of the cooking process. Once the syrup reaches 315, remove the pan from the heat. If you have a large heat-safe measuring cup with a spout, pour the sugar syrup into the cup to make it easier to pour into the mixer. If not, be sure to be very cautious when working with such hot liquids. With the mixer running, pour the hot syrup slowly into the egg whites. Beat them on high for an additional five minutes, or until they hold their shape. Stop the mixer and add the vanilla extract, almond extract, orange blossom water, salt, and butter. Turn the mixer back on and for an additional five minutes or until a thick ribbon forms when the whisk is lifted from the bowl. Stir in the nuts by hand. Pour the nougat into the prepared pan, and use an offset spatula or knife sprayed with nonstick cooking spray to smooth the top. Cover the top completely with another sheet of rice paper. Place a second 9x13 pan on top of your nougat, and place a large book or other heavy object in the pan to weigh it down. When you are ready to cut the nougat, spray a knife with nonstick cooking spray and run it along the edges of the pan to loosen the candy. Turn the nougat out onto a cutting board. 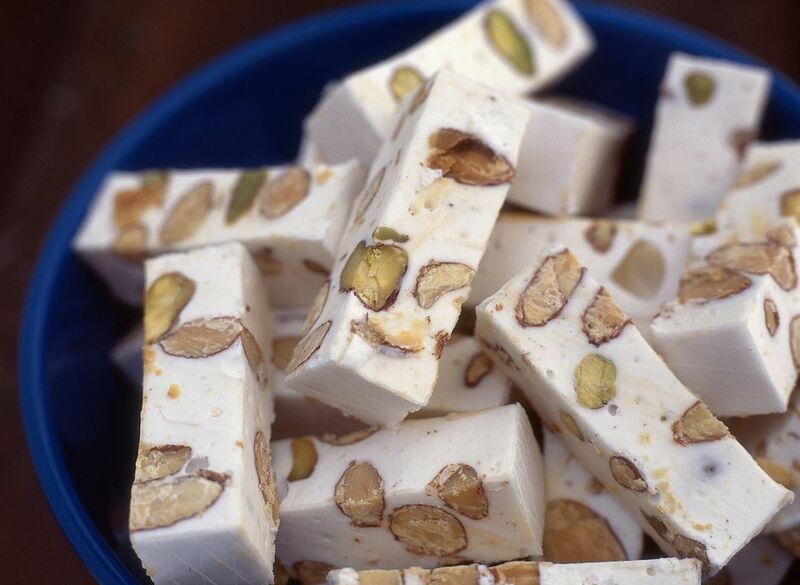 Using a knife sprayed with nonstick cooking spray, cut the nougat into small squares or rectangles. Nougat can be served immediately or stored in an airtight container at room temperature. You might want to wrap the pieces in waxed paper so that the sides do not stick together. Serve nougat at room temperature. Special Ingredient Notes: Orange blossom water can be found in Middle Eastern markets and in some large grocery or specialty stores. If you can’t find orange blossom water, it can be omitted, but the flavor will not be quite the same. This recipe also calls for edible rice paper, also known as wafer paper. The rice paper helps prevent the nougat from sticking to everything and makes it easier to cut, serve, and store the candy. It can often be found in Asian food markets and in some gourmet stores, or purchased online. Sugarcraft carries rice paper, and I have had good luck buying it on ebay for a low cost. (Note that edible rice paper is not the same as thin rice paper wrappers intended for spring rolls). If you cannot find any, line your pan with parchment paper or foil and spray it thoroughly with nonstick cooking spray. Click Here to See All Nougat Candy Recipes!